Back when I was in middle school and high school, my parents had small 4th of July get-togethers. It was mostly family, but as we got older, friends were invited, as well. 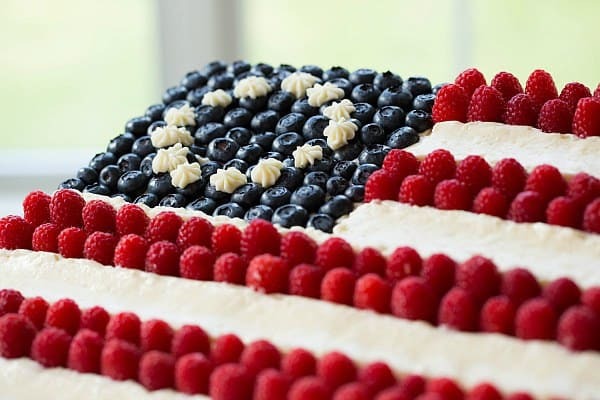 Nearly every summer, my mom whipped together the iconic flag cake. 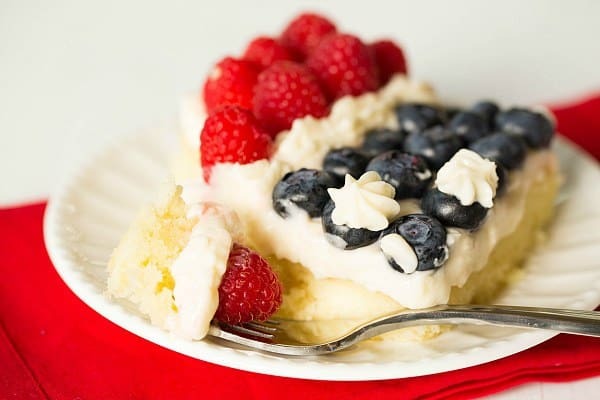 I’m sure you’ve seen a rendition of it at some point – a yellow or white cake (usually from a box mix), baked in a 9×13-inch pan, covered in Cool Whip, with strategically-placed blueberries and strawberries to represent the American flag. It was a staple at all of those summer parties, and I looked forward to it every year. I haven’t seen one made in ages, and decided that I needed to break the draught this year. Except, I wanted to make it from scratch and I wanted it to look a little more like a true flag. Mission accomplished! It goes without saying that this cake is heads and tails better than the version that was churned out in countless kitchens during the 1990’s. 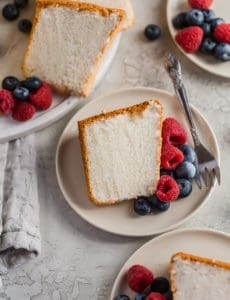 Not that there’s anything wrong with a box cake and Cool Whip – I’ve always been an advocate of having some easy recipes in your back pocket for those time crunches – but there’s no denying that a rich, buttery cake topped with cream cheese frosting takes the cake. (I know, I know, the pun.) You could slather cream cheese frosting on just about anything and I would devour it with gusto. 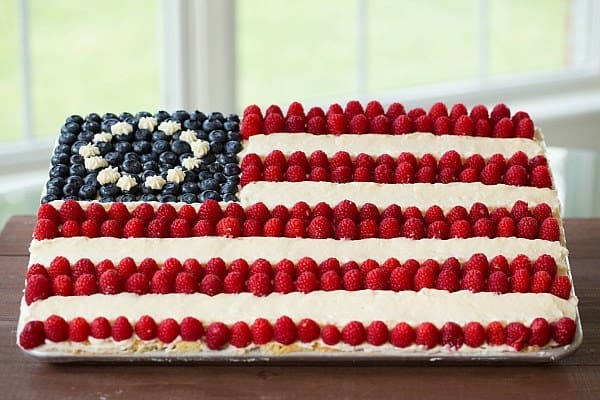 The cake is made in a half-sheet pan, which means that there is more than enough for everyone at your 4th of July festivities. The decorating takes a little bit longer, but I think the final look is well worth the extra effort. While I used raspberries, if you prefer strawberries, you could certainly use those. 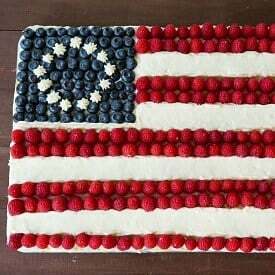 Feel free to decorate the stars on the blueberries any which way; since I had the space, I went with the colonial flag, but do it up however you’d like! 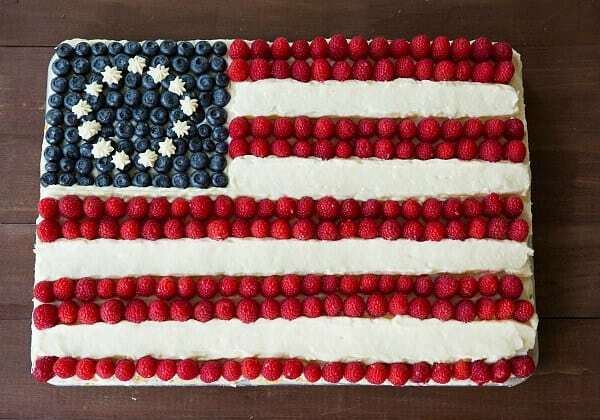 An iconic 4th of July dessert, this time made 100% from scratch! Make the Cake: Preheat oven to 350 degrees F. Grease and flour a 13x18-inch half sheet pan; set aside. In a medium bowl, whisk together the flour, cornstarch, baking soda and salt; set aside. Cream together the butter and sugar on medium-high speed until light and fluffy, about 3 minutes. Reduce the mixer speed to medium and add the eggs, two at a time, beating well after each addition and scraping down the sides of the bowl between additions. Reduce the mixer speed to low and add the sour cream and vanilla extract, mixing until just combined. Give the batter a stir with a rubber spatula. Keeping the mixer on low speed, gradually add the dry ingredients, mixing until the ingredients are just combined. Fold the batter with a rubber spatula to ensure all of the flour has been incorporated. Pour the batter into the prepared pan and spread into an even layer. Bake until golden brown and a thin knife inserted into the center comes out clean, 20 to 30 minutes. Place the pan on a wire rack and cool completely before decorating. Make the Frosting: Cream together the butter and cream cheese on medium-high speed until completely smooth, about 3 minutes. Reduce the mixer speed to medium-low and gradually add the powdered sugar. Once all of the sugar has been added and is incorporated, add the vanilla extract and increase the mixer speed to medium and beat until completely combined, about 1 minute. Decorate the Cake: Take about three-quarters of the frosting and spread in an even layer over the top of the cake. Using a toothpick, lightly draw a square in the upper lefthand corner of the cake. Fill in the square with blueberries. Place two rows of raspberries across the top of the cake to make a red stripe. Place the rest of the frosting into a decorating bag with a large tip and pipe two rows of frosting below the raspberries. Continue alternating rows of raspberries and frosting until you get to the bottom of the cake. Pipe stars onto the blueberries in whatever design you'd like. 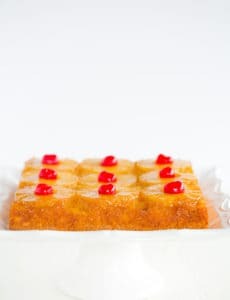 The cake can be kept at room temperature if it's cool and air conditioned; otherwise leftovers should be stored in the refrigerator, covered in plastic wrap. The cake will keep for up to 3 days, but is best served within a day of making and decorating it. I attempted to make this for Memorial Day. It tastes great but I live in Denver so my cake fell dramatically. Do you have high altitude instructions or recommendations? Thank you! It seems a shame the cake is served in the pan? How many people does this cake serve ? Hi Elda, You could do that! It yields 18 to 24 servings (see recipe box above for number of servings). I made this cake for a 4th party and it was a hug hit. Everyone loved it. And it is just beautiful. I know, I know, you posted this last year, but ive been browsing through all your recipes, since making your ny cheescake. 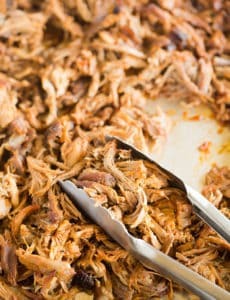 I actually made this exact recipe this year for our 4th of July party. It was a hit!! I am a huge fan of Ina Garten. At first, people werent too interested in eating cake because most were drinkimg alcohol, but one person took a piece and couldnt stop raving about it, soon the kitchen was full with people waiting for their slice. It was such a huge hit! On another note, the cheescake I made started out rough but I was able to salvage it and it was ah-mazing. I made your banana nut bread recipe this morning and there is none left. I am so happy I found your site! ! This cake is gorgeous, Michelle! It would be such a hit at any patriotic party. Love that you made it all from scratch! The cake itself looks so moist. My daughter and I, we made this today. And it was so yummy!!! Thank you so much for a great recipe!!!!! This looks perfect! I’ve always wanted to try one of these and your gorgeous cake is totally inspiring me! Your version looks so much more amazing than the one I made yesterday! Stunning! Saved for the next patriotic holiday!!! Love all your recipes!! Thanks! Gorgeous cake, I love every detail! 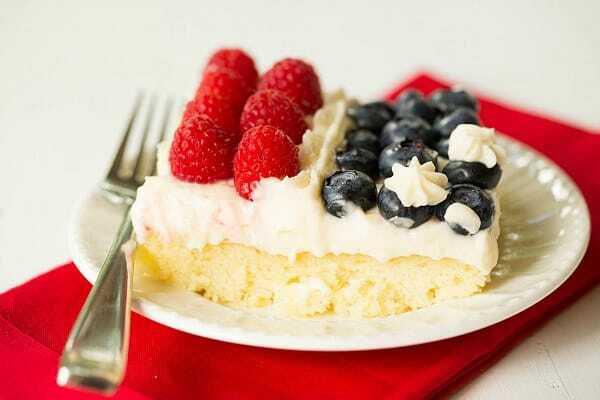 I heard from someone who reads both of our blogs that you had also done a ‘scratch’ cake for 4th of July; I’m so with you on doing it right instead of using Cool Whip and a boxed cake mix. This is beautiful and I’m sure DELICIOUS!